Postcard of Hemyock Bowling Club 1920. 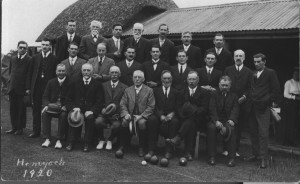 Centre row, Vernon Paul, Harry Summers, Tom Sandford, Mr. Phillips, Jack Sandford, Bill Griffiths, Reg Barton, Jack Exton, Mr. White, Antony Richards. Front row, Rev. de Burgh Forbes, Mr William Tait, Robert Tait, Mr. Wheeler, Bob Hill, P.C. Moulder (Policeman), George Paul.